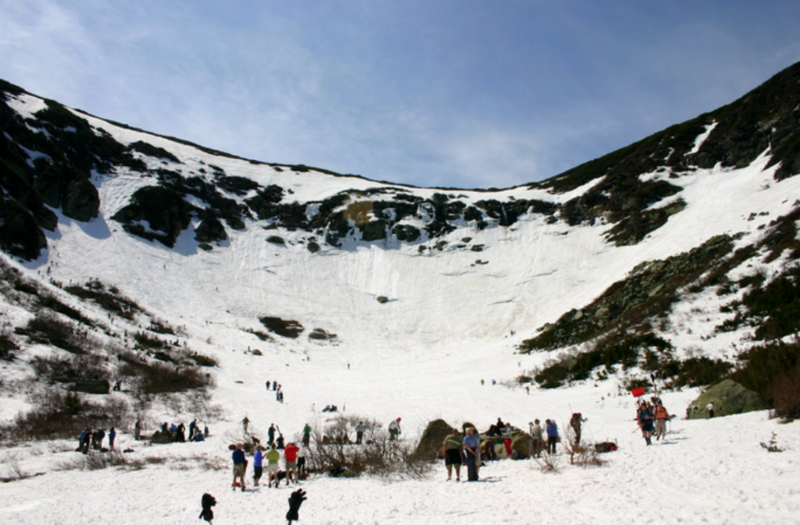 Tuckerman Ravine is a seasonal spring passage for many Eastern skiers. On spring weekends with good weather, hundreds — sometimes thousands — of skiers flock to Mount Washington, New Hampshire. 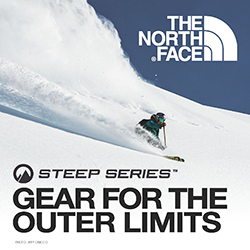 This famous backcountry area has some of the steepest terrain anywhere in North America with sustained pitches ranging from 40 to 60 degrees. In good snow years, skiers hike and ski the Ravine from April to July when the snowpack is stable. The Ravine itself is a steep bowl that starts with the headwall and drains into the hike-in approach. Big crowds gather at the bottom and on the Lunch Rocks to watch the skiing glory, and disaster, play out above. 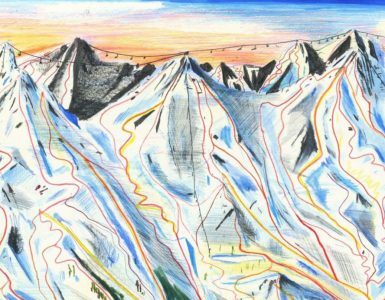 In 1939, Toni Matt became the first person to straight-line the headwall, accidentally, at the infamous American Inferno, a 4.2 mile race from the summit to base. Toni completed the 4,000 vertical foot course in just 6 minutes 29.2 seconds, reaching a top speed of 85 mph–on wooden skis. 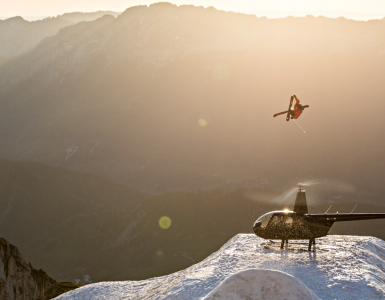 Matt was born in St. Anton, Austria. 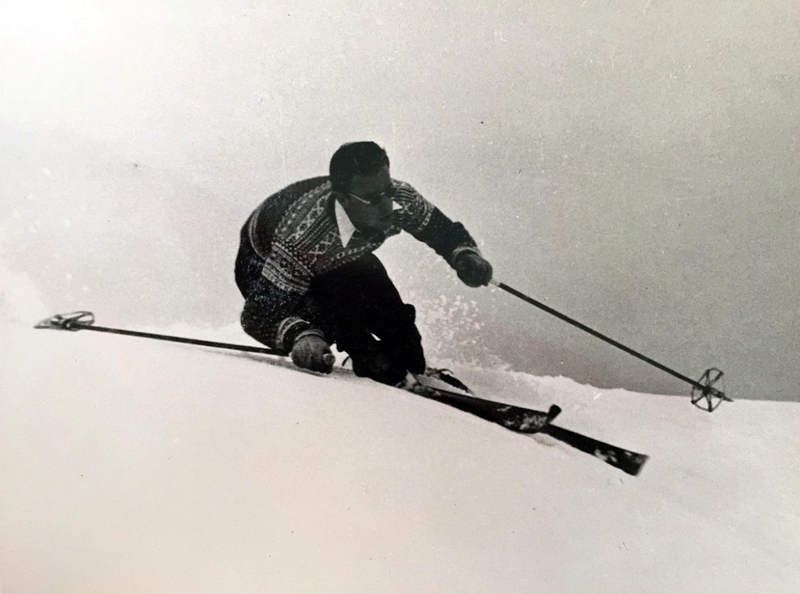 He came to North Conway, New Hampshire, in 1938 after becoming Junior National Champion in the Austrian Alps. 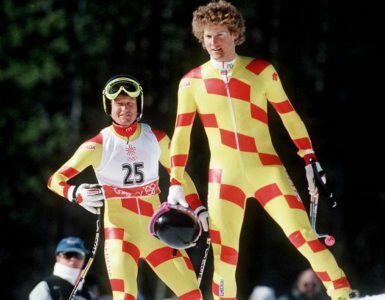 He was a protege of Hannes Schneider who became known as “The Father of Alpine Ski Technique”. 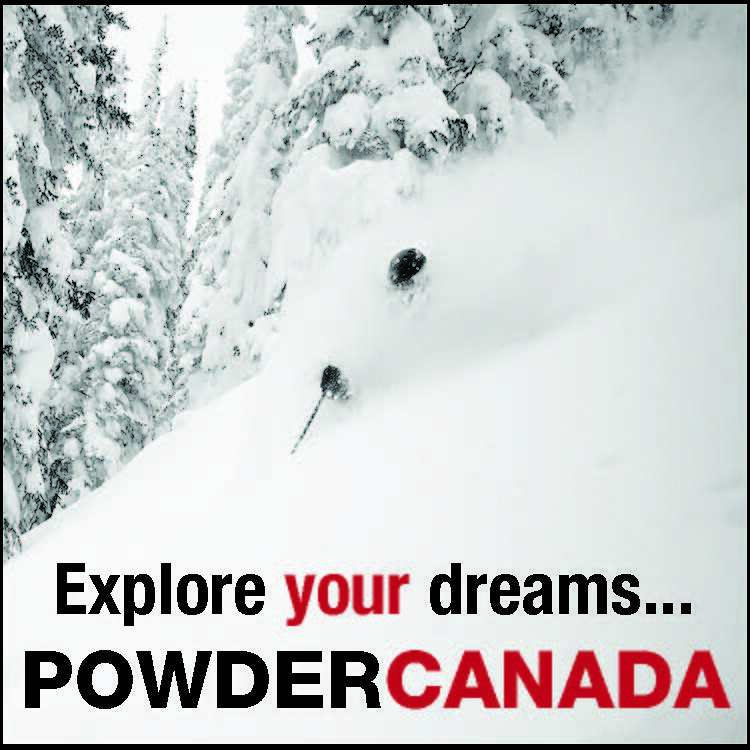 Schneider’s Austrians spread across North America, developing the ski industry post WWII. You don’t have repeat Matt’s feat in order to enjoy a spring weekend at Tuckerman, but can instead enjoy bootpacking up vertical chutes, find yourself super gripped above the Headwall—where all you can see is the bottom of the valley and the terrain just seems to waterfall into a vertical pitch below. Or, you can simply hand out in the sun and party on the lunch rocks. You have to be very experienced to ski Tuckerman Ravine on the southeast face of Mt. Washington. Chris Davenport and Hugo Harrisson are a bit of both. See their adventure in 2016 documented here. Andrew Drummond published the following video on Apr 30, 2018 and commented, “I’ve spent a lot of time up in the White Mountains over the past several weeks and wanted to share some of the video from these tours. 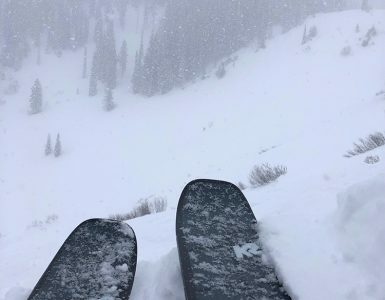 The winter was all over the map but this spring delivered big storms that kept everyone skiing through April. While the skiing was great, it’s honestly just an added bonus to being in the mountains with insane scenery.” Drummond’s skiing is more typical of Tuckerman’s conditions that Chris and Hugo’s experience. 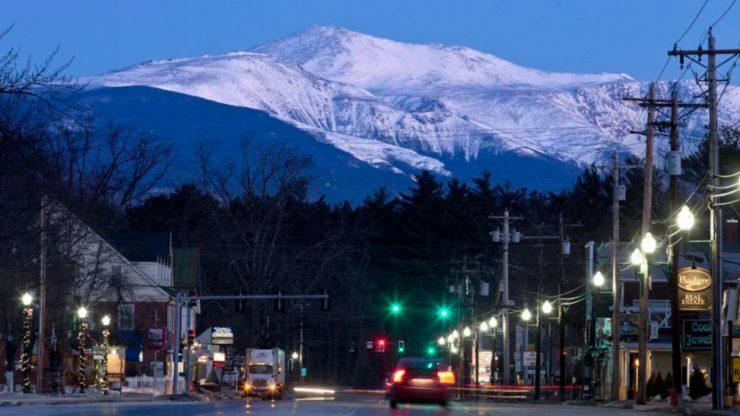 Mount Washington also has a dark side with a list of over 100 winter fatalities. 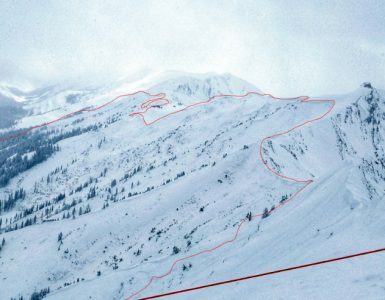 Last week a man was killed in an avalanche on Mount Washington near Tuckerman Ravine. 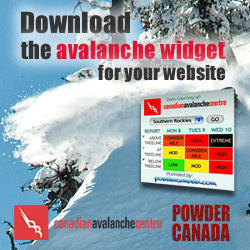 The incident was a human-triggered avalanche in the Raymond Cataract area. Snow rangers responded, and they saw one set of ski tracks going into the debris field and no ski tracks exiting. They activated a beacon search and located one beacon. 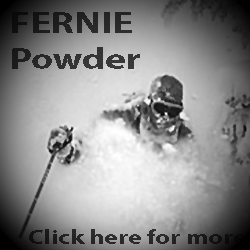 The skier was discovered about one meter under the surface. The avalanche was about 75 feet wide. 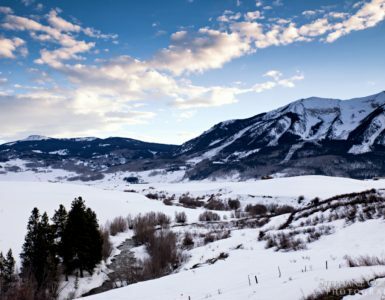 Although the winter is over, there is still strong potential for human-triggered avalanches on the trails. 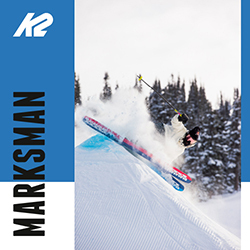 Skiers should check the forecast to know how to stay safe. 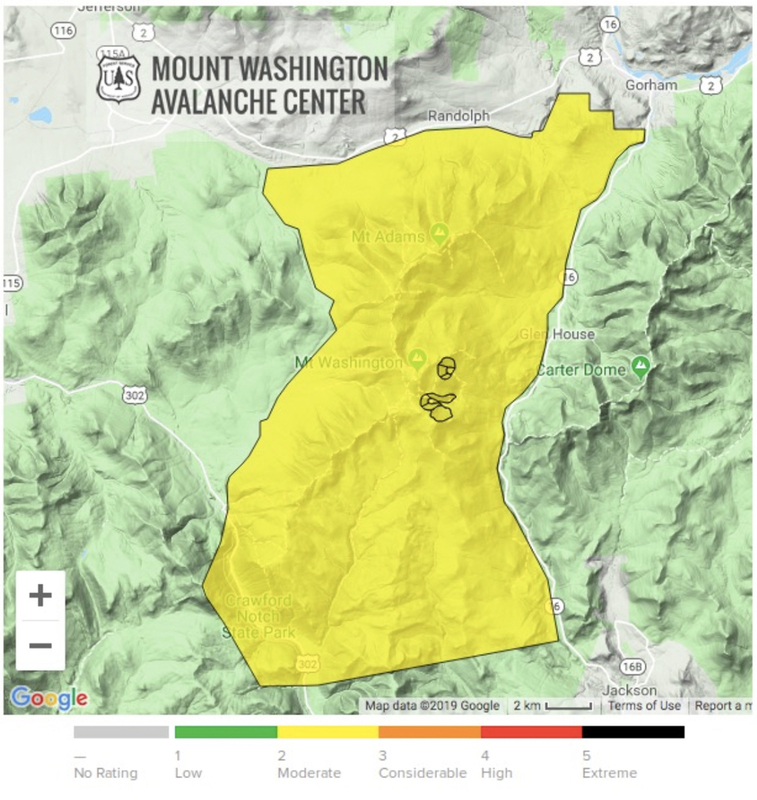 See the Mount Washington Avalanche report here.